What is the Krispy Kreme Challenge? 2400 calories, 12 doughnuts, 5 miles, 1 hour. The mantra of the Krispy Kreme Challenge epitomizes the test of physical fitness and gastrointestinal fortitude. 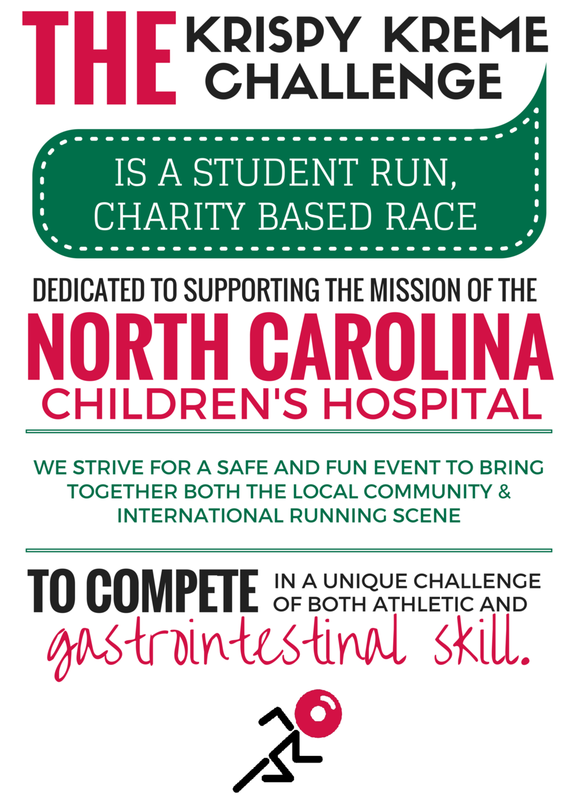 What started as a challenge among ten friends has transformed into a nationally publicized charity race, and the number one tradition to complete before graduating from North Carolina State University. On February 3rd, 2018, we hosted 5,516 people for the 14th annual Krispy Kreme Challenge, where we donated $170,000 to the UNC Children's Hospital, bringing the cumulative donation to over an impressive $1.5 million. We are now UNC Children’s Hospital’s largest unrestricted donor. Participants begin the Challenge at the Memorial Belltower on the campus of North Carolina State University in Raleigh, NC. Runners then travel 2.5 miles through historic downtown Raleigh to the Krispy Kreme located at the intersection of Peace and Person Streets, where they attempt to consume one dozen original glazed doughnuts. The hardest part of the Challenge awaits them as they run 2.5 miles back to the Memorial Belltower. This is the Krispy Kreme Challenge. The Krispy Kreme Challenge has a spot for everyone. From runners to volunteers, find the level of involvement that is right for you. Find out more about the Krispy Kreme Challenge, our history, our inspiration, and the people behind it. A dramatic tale of fun, community, and heartburn.